KNORR GARDE d'OR Pepper Prepared Sauce (with particulates) - A delicious and versitlie ready to use sauce. - Excellent on its own or enhanced by your own creative touch. - Suitable fo use on the hob, in the microwave or bain-marie. Water, vegetable oils (soya, corn), modified starch, CREAM, tomato, spices (green peppercorns (1.3%), black pepper (0.3%), white pepper (<0.1%)), salt, flavourings, cognac, caramel syrup, natural flavourings (natural CELERY flavouring, natural pepper flavouring), emulsifier (E472e), yeast extract, shallots, thickener (xanthan gum), colour (E150c). May contain gluten and egg. 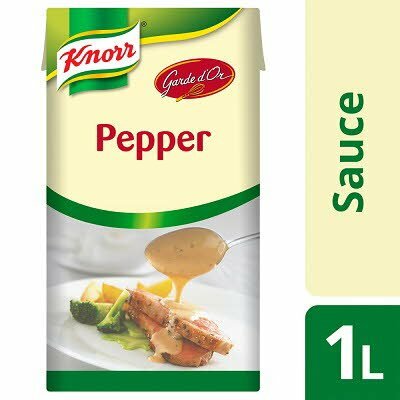 Knorr Garde d’Or Pepper Sauce – a delicious and versatile ready to use sauce. Excellent on its own or enhanced by your own creative touch. Knorr Garde d’Or Sauces complement meat, poultry, fish and vegetable dishes. Suitable for use on the hob, in the microwave or bain-marie.